Joseph Baio, who represents Morel, said the ruling proves that images taken from Twitter without permission cannot be used for commercial purposes. 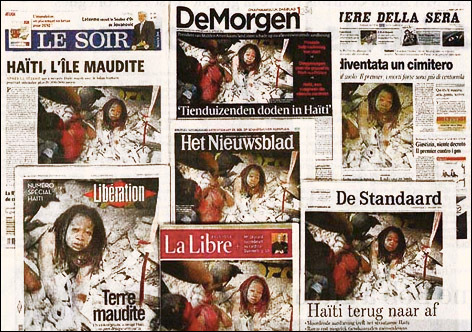 Danial Morel’s photos of the 2010 Haiti earthquake make the front pages of newspapers and TV broadcasts around the world. …click to enlarge. This story started when Morel, 62, a well known photographer for his years of work in Haiti posted the first photos of the 2010 Haiti earthquake to his Twitter account for his clients to see. An editor at AFP discovered Morel’s photos through another Twitter user’s account, downloaded them, striped the identifying metadata and gave them to Getty, a partner agency, for distribution. The photos were then widely disseminated to Getty’s clients worldwide. AFP also distributed a number of the images on their network. When Morel complained about the copyright infringement AFP filed the lawsuit in 2010 against Morel, seeking a declaration that it had not infringed on his copyrights. Morel then filed his own suit. In the Jan 2013 preliminary hearing AFP had initially argued that Twitter’s terms of service permitted the use of the photos but Judge Alison Nathan found that Twitter’s policies that allowed posting and retweeting of images but did not grant the right to others to use them commercially and that AFP and Getty committed a willful violation of the US Copyright Act and ordered the case go to trail to award damages. The jury also found AFP and Getty guilty of violating the Digital Millennium Copyright Act: specifically for altering Copyright Management Information and for adding false and misleading CMI. AFP had removed Morel’s identifying metadata and credited the photos to another photographer. For this they awarded Morel a further $20,000. At trial, AFP lawyer Joshua Kaufman, blamed the infringement on an innocent mistake and said the Twitter user who posted Morel’s photos without attribution bore responsibility for the error. The AFP editor, Kaufman said, believed the pictures were posted for public distribution. The $1.2 million was the maximum statutory penalty available under the US Copyright Act. AFP had asked for the award to be set at $120,000. Several news outlets that published Morel’s images previously settled with the photographer for undisclosed amounts, including the Washington Post, CBS, ABC and CNN. Twitter was not a party in the case. “As has always been our policy, Twitter users own their photos,” a Twitter spokesman said. Reuters coverage of the November trial.